Drill teams and precision have received a bad wrap. 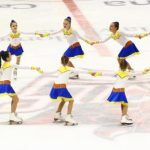 While some parents may have let their daughters join a team for a year for fun, if your child was serious and had a future in skating (read “Olympics”), you would never waste her time or your money on a team. It was for skaters who couldn’t hack it. Right? Well, it never really was. But that’s the reputation synchronized skating seems to have. It’s for those who just aren’t good enough to compete individually and it’s a waste of time for anyone who is. That is completely untrue. If your daughter (well, actually it is a co-ed sport, but its like 90% female in the US) has a passion for skating and the talent to go with it, spending some time on a team may actually improve her skating and move her ahead of her peers. Skaters learn how to do neat footwork right under their own bodies, not sprawled out all sloppy and crazy. You can’t get away with that in a line or you will trip your neighbor. Learning how to skate at exact speeds and put each step at the correct time in the music (so everyone does the steps at the same moment) will improve a skater’s accuracy and performance in an individual routine. The skaters are having fun while practicing moves in the field and other maneuvers at the same time. Team practices also help stamina. Skaters have to skate for 2 to 4 minutes or more straight through. There is usually no “slow” part in the middle for catching one’s breath. And during precious on-ice practice time, you repeat sections and finally the entire program over and over. After that kind of workout, an individual program is a piece of cake. Serious USFSA teams also know the importance of performing. The coach probably says “smile” almost as often as “keep those lines straight.” And since the judges sit high up in order to appreciate the formations, team members learn from the beginning to keep their heads up and smile. Skaters also need to maintain excellent posture and strong arms to look good and maintain the proper formations. These are just some of the benefits. Being on a team also has other advantages. Single skating is an individual sport–one that often puts “friends” or acquaintances against each other. 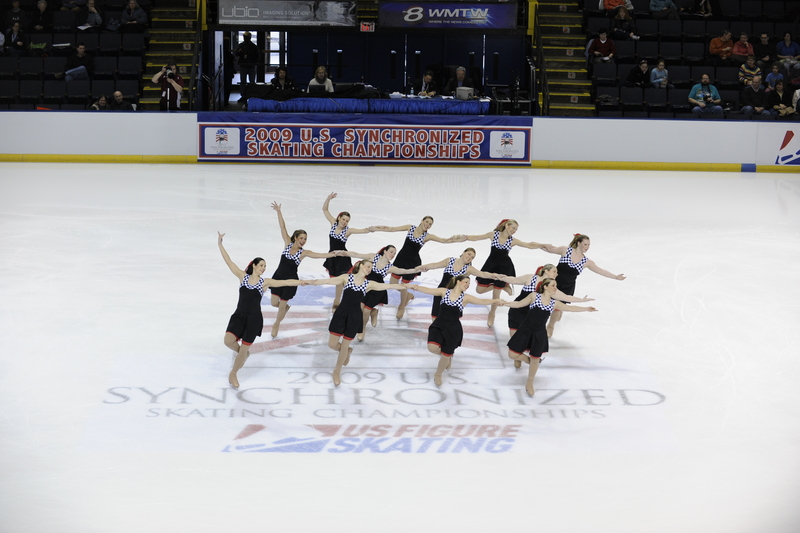 Being on a team not only gives skaters the opportunity to work together and learn from a team experience. It also get ever member (and parent) of the team routing for teammates, anxious for their success and improvements. After all, as each individual skater improves, it brings up the level of the entire team. So don’t scough at team skaters and don’t ignore it until you give it a try.